Cold pressed oil obtained from the seeds of the Sacha Inchi plant from the Amazon jungle. One of the highest content of polyunsaturated fatty acids (PUFA) among all vegetable oils with alpha-linolenic acid (Omega 3) up to 48% and linoleic acid (Omega 6) up to 36%. Also contains oleic acid (Omega 9) up to 9% and a high concentration of Tocopherols specifically gamma and delta Tocopherols with 1,900 mg/Kg. It has an ideal balance between Omega 3 and Omega 6 (1.4 to 1). Due to its slightly nutty flavor it is ideal to be consumed directly or in salad dressings, vegetables, pastas, yogurts or smoothies. 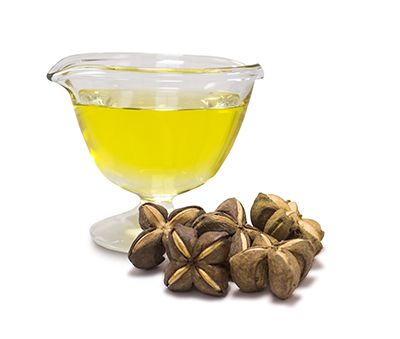 Also, our sacha inchi extra virgin oil can be used as a cooking oil and add Omega-3 fatty acids to homemade dishes as it is suitable for all types of cooking methods, including baking, roasting and stir-frying. Due to its high content of naturally occurring tocopherols, our sacha inchi extra virgin oil has a high smoke point of 491ºF/255ºC that is higher than most unrefined vegetable oils in the market allowing it to withstand cooking over medium-high heat. For personal care formulations in anti-aging creams, lotions and emulsions for the skin, liquid soaps, and products for dried and damaged hair. Helps support healthy blood pressure and cholesterol levels within a normal range. Contributes to enhance immunological system. Excellent antioxidant and anti-inflammatory properties. Emollient and skin and hair smoothing properties. Aids in the prevention of wrinkles and restores elasticity.